Concealed thermostatic 2 ways 1/2”-3/4” with wax thermostatic element. Manual diverter. Flow rate bath 26 l/min.at 3 bar and flow rate shower 13 l/min. at 3 bar. Built in non-return valve. Safety stop at 38ºC. Bathroom taps Nk logic 100124172 Thermostatic smart box external component. Exposed bath/shower mixer with automatic diverter, fixed shower bracket and 1/2” hose connection. Wall thermostatic shower mixer Anti-limescale hand shower with directable support. Hand shower hose. Wall thermostatic bath and shower mixer with cascade. Anti-limescale hand shower with directable support. Hand shower hose. Thermostatic wall mounted bath mixer, safety lock at 38°, automatic diverter, aerator 28×1, handshower, bracket, 150 cm flexible shower hose Cromalux. Thermostatic wall mounted bath mixer, safety lock at 38°, automatic diverter, aerator 28×1, handshower, fixed bracket, 150 cm flexible shower hose Cromalux. 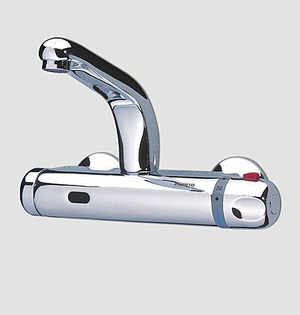 External part for built-in shower mixer 4-ways outlet, thermostatic mixer with safety lock at 38°. To be matched only with FIIN00650. Thermostatic wall mounted shower mixer, with duplex shower. CODE ST20612 DESCRIPTIONThermostatic built-in bath/shower mixer, with diverter for bath-shower. Wll-mted thermostatic mixer + handshower set , rim-mounted (006.7.78.00) or on feet + T (700mm)(006.7.88.SC). Available in a large choice of finishes. The advantage of a temperature-regulated single-handle mixer tap is that it prevents scalding by limiting the temperature of the water. On ArchiExpo, such taps are categorized by properties such as material or finish. At home, these devices offer superior comfort by limiting water temperature. They are often installed in public and commercial settings to enhance safety and ensure the economical use of energy. Consider installation method and how the style suits the space. Evaluate sturdiness and maintenance requirements. Some finishes show watermarks. Favor designs which are easy and comfortable to operate. Check the terms of any guarantees or warranties. Verify tap suitability for intended use. Kitchen taps may have a long, pivoting spout so that large items will fit underneath, while bathroom taps are generally more compact.